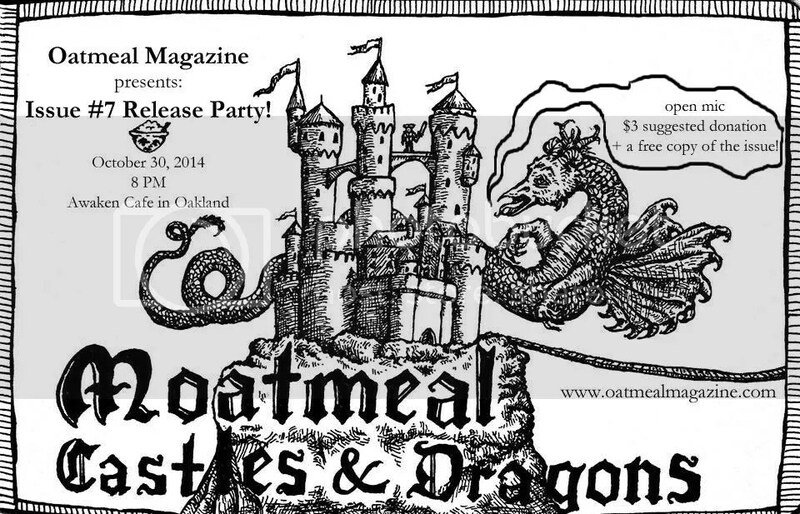 Moatmeal: Castles & Dragons RELEASE PARTY Oct. 30th at Awaken Cafe! Has it been one thousand fortnights or what! Verily, it is so. This summer, Master Oatmeal went feudal once again and lost himself snacking on blackberries and napping in the warm backyard brambles of the Oatmeal HQ Fortress. 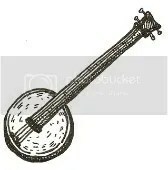 He rattled his adufe and sang sweet tunes to hazy golden dusks while his pet baby dragon, Alberta, snarfled and rolled around in the honeysuckle. But we hope you all know that it’s back to the inky old grinding wheel, friends, because — by our troth! 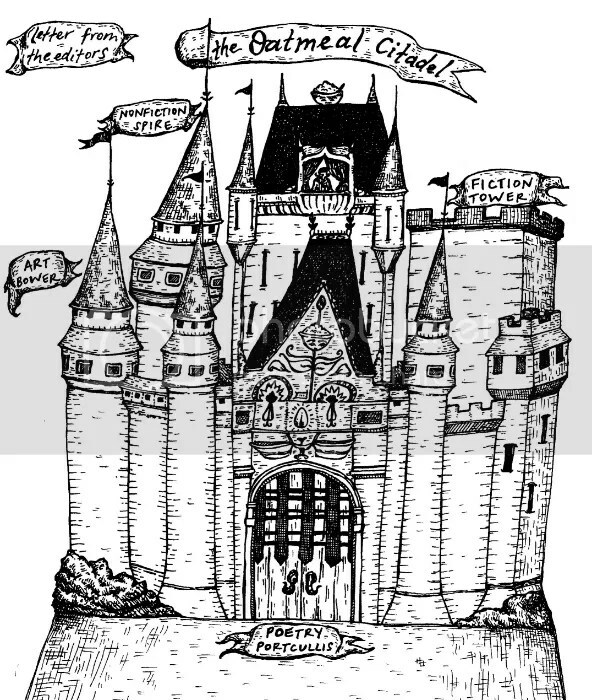 We are setting the type for our SEVENTH issue, Moatmeal: Castles & Dragons, and we have SO MUCH EXCITING NEWS. This whopping batch of heartily seasoned frumenty, a long time simmering, brims with poems about finding love in rivers and looking for a sense of place in watermelon patches. As usual, it will make you weep into your black gritty coffee and grin real big between mouthfuls of eggwich. We couldn’t be more thrilled to assemble and share this miscellany, and indeed, the time hath come, friends, for another riotous RELEASE PARTY! Our hugely generous friends at Awaken Cafe in Downtown Oakland have invited us back on October 30th at 8pm for an evening of open mic and fiery readings that will disembowel you and leave you hugging your new friends, laughing and crying for more. We’ll read, we’ll listen, and we’ll imbibe. AND, because October 30th is Halloween Eve, there will be costumes. Come sporting the Grendel outfit you used to wear to Old English seminar, and croon your bundle of poems about jousting and quail pie. Invite everyone you know! We can’t wait to see you and hear what you’ve been working on. It may have been awhile, but we still know what you’re thinking. Why do my fried eggs always kind of resemble steamrolled bullfrogs? And WHAT have these indolent goons been doing for the past five months? Well, for once, we have satisfactory answers. 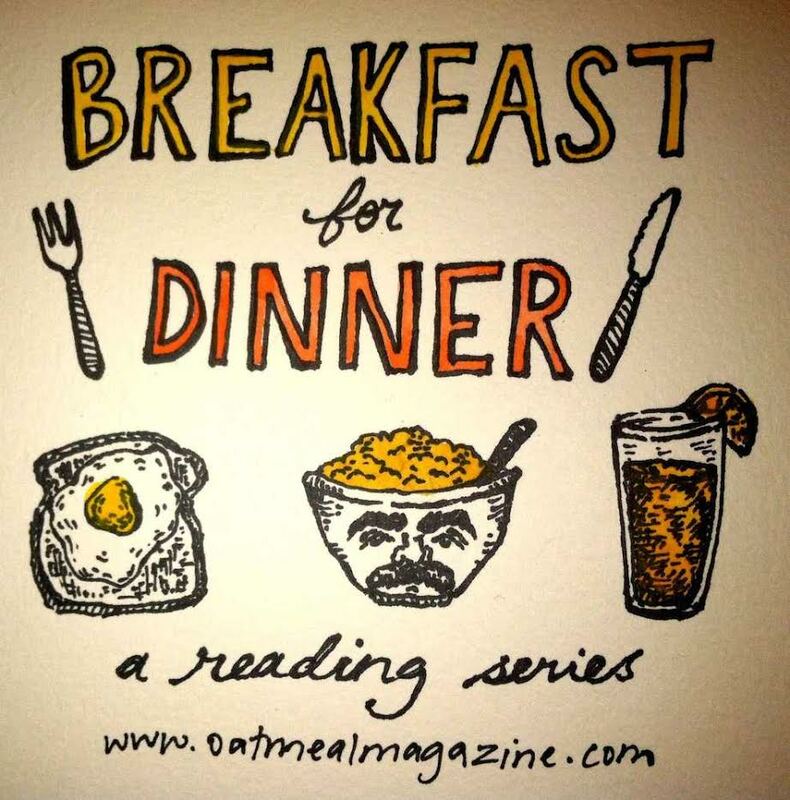 We kicked off our monthly reading series, Breakfast for Dinner, in May! In case you haven’t heard or experienced the magic, Breakfast for Dinner is a cozy affair, hosted at Trisha’s or Claire’s house, featuring lively readings and mad snacks and refreshments and the most wonderful people. These evenings are commonly described as “a total delight and a half,” so be sure you add Master Oatmeal on Facebook and stay tuned for the next one in November. Lastly, we’ve launched a fundraiser! Soon it will feature an adorable and elaborate video, but the page is still functional enough for you to donate dollars that will keep us printing and eating. Thank you for every little drop in our oat bucket. See you ALL on October 30th! Posted in Uncategorized | Comments Off on Moatmeal: Castles & Dragons RELEASE PARTY Oct. 30th at Awaken Cafe! Hall & Oatesmeal PRINT ISSUE release party 4/5 at Awaken Cafe! Hello, fantastic and talented writerfolk! We hope and trust that you’re thriving and taking one of Master Oatmeal’s beauty tips and soaking your hands and feet in a tub of warm oatmeal on these cold, rainy nights. We wanted to let you all know that we have officially scheduled the release party for Hall & Oatesmeal: Making Your Dreams Come True, the print issue! It’s going to be on Saturday, April 5th at 7PM at Awaken Cafe in downtown Oakland (here’s the Facebook event page). Tattoo the details on the back of your hand! Gather all of your writing bits to share! Tell your friends! Please let us know if you’d like to read — a few of you have gotten back to us, and we’re dancing all over Oatmeal HQ in anticipation. It’ll be a night studded with fiery readings and Master Oatmeal’s decadent revelries, featuring wonderful people, drinks, an open mic, mugs, and screenprinted odds & ends to buy. It’d be a total treat to see you all there! In the meantime, we’ll hold up our end of the bargain and try to find a fog machine and giant plaster moon so that we can reenact this video. Posted in Uncategorized | Comments Off on Hall & Oatesmeal PRINT ISSUE release party 4/5 at Awaken Cafe! 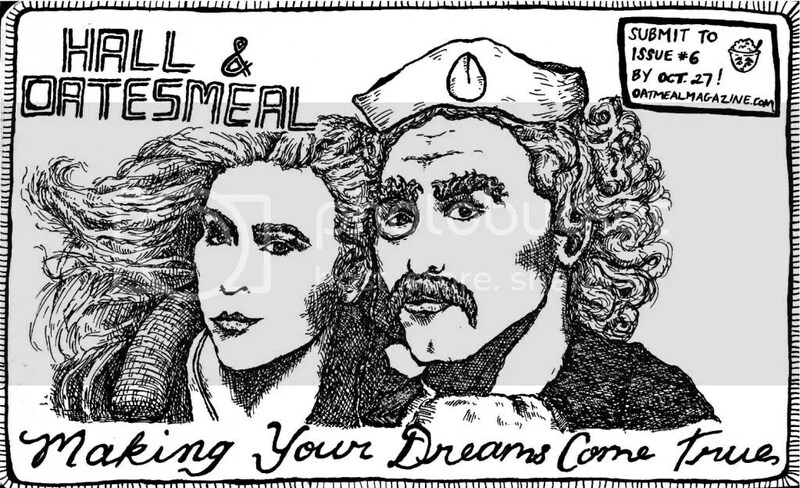 This fall, Hall & Oatesmeal will make your dreams come true. Submit by Oct. 27! We are writing to you, live from Daryl’s house, with great big news and the grandest “hello again!” we can muster. It has been a wild few months, from licking the Goatmeal harvest off of our fingers to trying to map out our next moves. And we are planning some big moves, people. Moves so ambitious and outside the bowl, if you will, that they will make you just toss off your hats and jitterbug with surprise. Hall & Oatesmeal: Making Your Dreams Come True! Inspired by the oft-forgotten but enormously influential duo, Daryl Hall & Master Oatmeal (little-known fact: David Bowie attributes the magic of “Let’s Dance” to their revolutionary rhythms). The two met one auspicious autumn equinox in Jackson Hole in 1982 and recorded some sweet, sweet jams that were kept in air-tight jars deep in Daryl’s basement — until now! Thanks to the nosy archivists on staff, the recordings will be released and spread all over your ear-toast so soon. Perhaps at the release party. The release of this issue will also (really, we mean, yes, we really truly promise this time) coincide with our first print issue EVER! Because we, too, are hellbent and intent on making our paper dreams come true. Imagine how lovely an Oatmeal booklet will feel in your hands — the embodiment of sleepless nights in Oatmeal HQ and the gentle sacrifice of a few slender trees, all in the name of oatmeal. With the turn of every page, you’ll be able to hear the pine that fell onto the welcoming earth, closed its eyes, and murmured to itself, “Well yes, for this, it was worth it.” Thank you, future trees. — But the money! Where does it all come from? — you may ask. Good question. We often ask ourselves that, too. In order to get our print publication out, we will be putting our project up on Kickstarter, with the goal of raising $500 toward the Oatmeal Fund. But let’s save that for another post. For now, keep writing. PS – Also sign up for OatMAIL! Posted in Uncategorized | Comments Off on This fall, Hall & Oatesmeal will make your dreams come true. Submit by Oct. 27! Goatmeal deadline extended to May 18th! But hooray, he’s back! And we are gearing up for a hearty, hearty Goatmeal harvest and the rowdiest celebration since 1999. The goats are antsy and yelling like one million humans, and they are just to the MOON with excitement for the fifth issue. Have you seen goats on the moon? It’s one of our favorite things. But first, we have news! 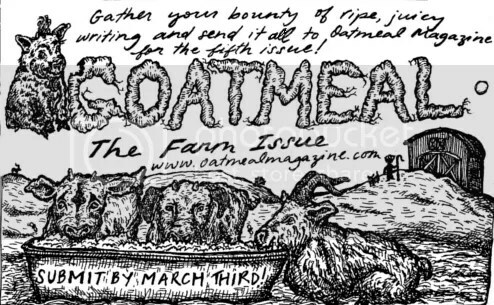 We are reopening the gates for Goatmeal: The Farm Issue submissions! These past few months have been all kinds of nutty, and as Master Oatmeal always says, the more oats, and of course the more pygmy goats, the merrier. Why not harvest a little late, if we can fill our cornucopias (and our cornucopias’ baby cornucopias) to the brim, right? If you’ve been weeping into your night oats since March because you missed your chance to contribute to the feast, you can still send us your favorite (or least favorite) goat doodles, oatmeal odes, or pie contest parables (or ANYTHING you’ve written, farm-related or not!) by Saturday, May 18th! But also, always feel free to send us things you’ve written! The other little slice of news: we are going to have a release party! Somewhere, sometime. The date and location will remain a surprise. But not for long! Stay tuned! And keep your calendars vaguely open in late May and early June. Well, friends, that’s all for now. We’re as excited to bundle up and release all of your wonderful pieces into the world as we are to garb our goats in summery Renaissance gowns. Contribute everything you’ve ever written to Goatmeal, and then come drink from our oatmeal stout fountain! P.S. Sign up for OatMAIL! What else will we do with our doodles? Posted in Uncategorized | Comments Off on Goatmeal deadline extended to May 18th! Procure your finest peacock quills and richest blackberry ink for GOATMEAL: The Farm Issue! Howdy-do, long-lost friends of the most nourishing literary oat mill in the universe! As it usually goes with our unannounced extended hiatuses from these here ethers, we’re back with some very exciting news. First, a rather long overdue announcement that the new family favorite, Votemeal: The Political Issue, was born! Its moist thud against the virtual shelves could be heard around the world about two months ago. In the slightly altered words of Michiko Kakutani, the potent brew of pieces swirled into that issue have tickled the Bay to the darkest depths of its core with the force of a fourteen- floored campaign office fueled by bottomless steel cut oats. Although Master Oatmeal didn’t *technically* win presidential office, he still gave us so much. (We would have posted his concession speech, but it was really performance art — of the most ephemeral sort — and no transcription would have done his graceful hat-hanging a teaspoonful of justice. And we live for justice in Oatmeal Headquarters.) A most heartfelt thanks, from the bottom of every crusty oatmeal pot, to all of our rock star contributors for providing us with the finest garnishes on this side of the… pancake! Bit of tantalizing news #2: We have ANOTHER issue in the works. That’s right, number five (five! ), Goatmeal: The Farm Issue! During his whistle-stop campaign tour, Master Oatmeal discovered that he’s really a grassroots kind of guy — quite literally. He loves grass, he loves roots. In fact, our long vacation from Oat-related business wasn’t due to his usual drifting down the Amazon in a purple velvet-coated yacht, but rather because it’s a rare afternoon these days that we’re able to lure the seasoned gardener into Oatmeal HQ from his urban oat farm for an oatmeal stout and our weekly oatmeal bath. A true renaissance man! We can see him right this moment through the window, weeding in his straw porkpie hat. His smooth, rich bronze is comparable to a Rodin. And his zeal for hearty breakfasts and good reads only grows. Could there be more staggeringly fitting symbolism in his new green-thumbed hobby? In any case, let’s fix ourselves a plentiful springtime harvest — contribute to our cornucopia with anything and everything you’ve been working on by March 3rd! We will shake the frost from the soil and revive our fallow land with your vibrant pieces about winter squash, fainting goats, hydroponic systems, or that one time you got lost floating down the King River and had to hitch a ride from a truck driver in a sprawling corn field… Send it all! We welcome everything, farm-related or not, with our very special submission jig that involves several rapid-fire successions of high fives. Perhaps we’ll share a video of it one day. Speaking of videos, the Master Oatmeal web series (a collaborative project with Mr. Niklas Lollo, the master of all things fun and high in fiber) is still gurgling away in the Crockpot! A teaser: there will be a human hatched from a pot of oatmeal! Just as evolution intended. And there will be stop-motion animation. Oh, holy oats, we’ve said too much. Also be sure to sign up for OatMAIL! Don’t miss your chance to receive doodles on paper napkins, inane jottings on other surfaces, and a little package with doodles of your favorite animal on your birthday — for free! Welp, that’s all we’ve got. Send us your platters of freshly picked roots (savory oatmeal, anyone?) and wild, juicy ideas for an utterly Bacchanalian potluck! Goatmeal will be the hoedown barn dance of your wildest dreams (baby goats and square dancing included, of course). Posted in Uncategorized | Comments Off on Procure your finest peacock quills and richest blackberry ink for GOATMEAL: The Farm Issue! Happy National Black Pudding Day from Oatmeal Headquarters! We hope you all have been doing oatastically in the eons since our last correspondence. We’ve been steeping in the vat of your soupiest, most delicious submissions, indulging in the warm, hearty voices of today. Votemeal crafting is well underway, and we are so excited to announce that we will release it on November 7th, just after Election Day! Results will be in, and you’ll finally know what came of the Oatmeal Party this season. And you’ll have so many wonderful things to read! We also have a web series about Master Oatmeal forthcoming. PBS badgered us about a documentary for months (for months! ), so we finally agreed to let them flood our offices with their most distinguished camera folk. Stay tuned! It’s going to be out of this world. How to make blacke Puddinges. Take Otmeale and steepe it in sodden Milke, then take Hogges suet & good hearbes and chop them small, then put in fennell seed, pepper and Salte. We always like to leave you wanting more. Until November 7th! Posted in Uncategorized | Comments Off on Happy National Black Pudding Day from Oatmeal Headquarters! VOTEmeal deadline extended to September 16th! Master Oatmeal’s presidential campaign has brightened his and our past few months with so much high-fiber pleasure that we couldn’t bear to watch all the fun come to an end this summer. He has continued his voyage aboard the Oat Express (with a few quick stopovers in Mykonos), enjoying his usual revelries and scattering his illuminating words and oats across all the land. Be sure to stay tuned for our full (and live!) coverage of the Oatmeal National Convention in the next couple of weeks. In the meantime, keep on rocking the Votemeal like the true oat-metal heads we know you all are, and submit your oats by September 16th! Votemeal: The Political Issue will surely be a batch to remember, and you deserve the opportunity to contribute to and partake in this feast of historic proportions. PS – Get your dream manifesto into our flash fiction contest while it’s hot! Posted in Uncategorized | Comments Off on VOTEmeal deadline extended to September 16th!